I bought a pasta maker many years ago and used it a few times. Then, two years ago, when we moved, I couldn’t find the damn thing. Even though it was something I hardly used, I was determined to find it. But I couldn’t. I figured it had run off with my white Chantel soup pot because it too, was missing. So last December, I was digging around in the laundry room for something else entirely, when I opened a bin that was supposed to contain miscellaneous crap. Well, there it was. Along with soup pot. I let out a celebratory yelp and the Husband rushed in, wondering what my deal was. When I showed him that I finally captured the elusive kitchen appliance, I assumed he’d be as excited as I was and happy that I’d quit lamenting over losing the thing. But he didn’t seem too thrilled. He left the room and returned with a wrapped box, about the same size of the box I held in my hands. “I’ll take this one back tomorrow,” he mumbled. He had gotten me a new pasta maker to replace the one I “lost.” He was really happy that I found it, but then he had to come up with something else to give me for Christmas. So jump to October 2011, nearly a year later. It was the first time I used that stupid pasta maker since finding it. I know, it’s terrible . . . the Husband wasn’t even home to enjoy these raviolis! But now that I have some practice, I’ll make more of an effort to use it because there’s nothing like fresh pasta. 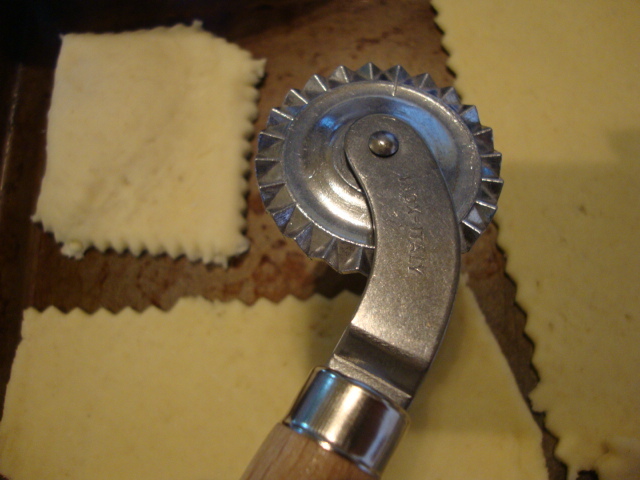 Making fresh pasta, however, isn’t always easy, especially raviolis—it will take some trial and error to get these right. Regardless of their less-than-pretty appearance, they were delicious! 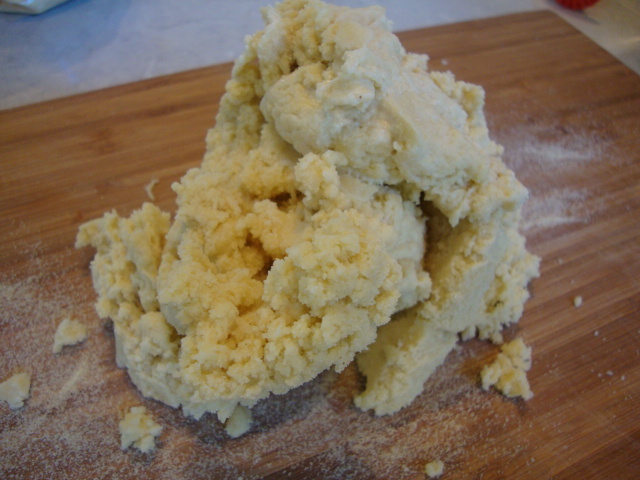 Using a food processor with the sharp blade, pulse the flours and salt together. While the machine is running, add the oil and water. The dough shouldn’t be sticky. Knead the dough using some all purpose flour. 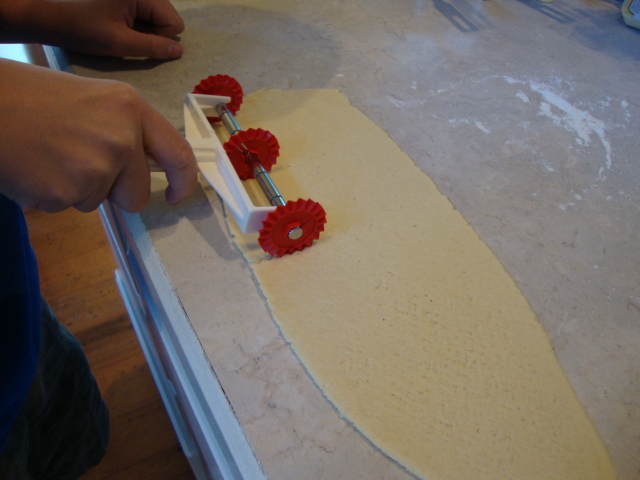 Using small pieces of dough, feed it into the pasta maker—the widest setting, then one notch thinner, then a third time on the next thinner notch. The Seventh Grader and I didn’t quite figure this method out until halfway through, but oh well, we had fun experimenting. His job was to cut the rolled out dough into squares. Place the squares on a cookie sheet or cutting board to dry a little—about 20 minutes. Meanwhile, combine all the filling ingredients, except the mozzarella, in a food processor. Transfer to a bowl and stir in the cheese. 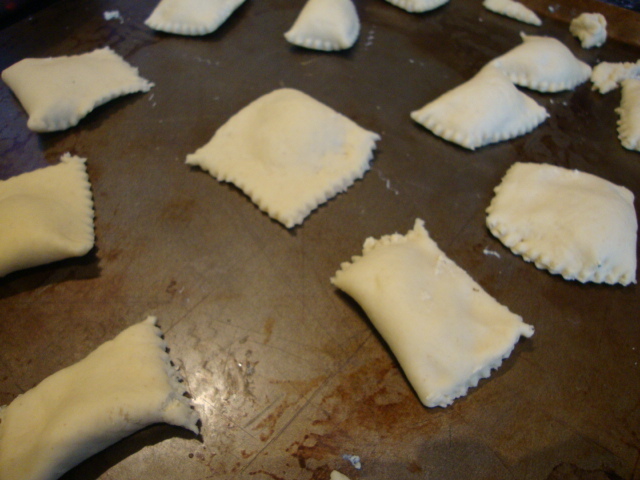 Place a small scoop, about a teaspoon of filling in the middle of each ravioli square. There are other ways of doing this. 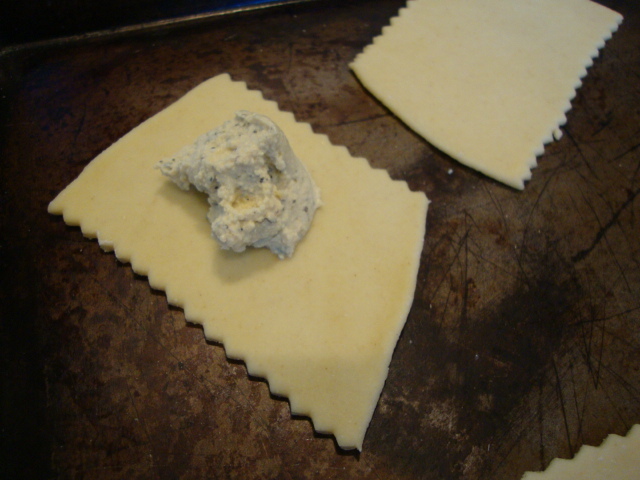 I think it’s better to NOT cut squares first, but to have a long piece of rolled out dough, place the filling dollops in a line and fold over the dough, then cut using a pastry wheel to seal the edges. I finally got smart and used the pastry wheel to seal the edges instead of a using a fork, but accumulated an unusable pile of dough shrapnel. Anyway, we ended up with pretty ghetto ravioli. In batches of 5-6, add them to boiling water and cook for about 2-3 minutes; remove with a slotted spoon. Top with warm spaghetti sauce and enjoy! Ha ha that’s a cute story 🙂 I think your ghetto raviolis look great! I made pasta once and while it was a lot of work (no food processor and no rolling pin), I was so happy with the results. It’s one of those things that you feel pretty good about once you’ve done it! I would love to get a pasta maker someday, though just a couple weeks ago I discovered how easy it is to make ravioli out of wonton wrappers. 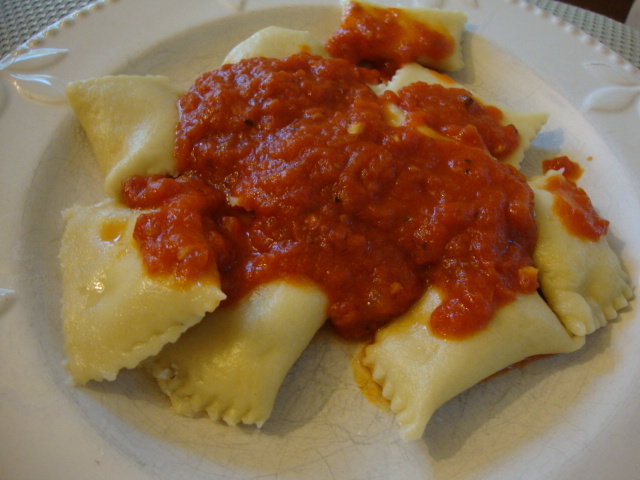 They have a very slightly different texture than western ravioli, but they’re delicious, cheap, and easy. I just made pumpkin-filled ravioli but I’ve printed out your filling recipe – I can’t wait to use it!!! I’ve only used won ton papers once because I was able to find some made without eggs, but I haven’t been able to find that brand again. When I do, I’ll definitely give those a try–great idea! And pumpkin! That sounds delicious. Thanks!